There is a difference among hot sauce fanatics between the tasters and the masochists. For the tasters, hot sauce exists to coax flavor from food and elongate the sensation of taste. The masochists, by contrast, seek to push the limits of tolerance. They're in it for the fix and, of course, the bragging rights. David Ortiz, the amiable if presently downtrodden Red Sox slugger and self-described "grill man," is a taster. Inspired by a well-documented affection for spicy Dominican food and backyard barbecues, Ortiz's new line of Louisiana-style hot sauce, Big Papi En Fuego, is for chili connoisseurs (en fuego is Spanish for "on fire"). Now in supermarkets, four preservative-free levels include Original En Fuego, Monster Double En Fuego, Off the Wall Triple En Fuego, and Grand Slam En Fuego, the fieriest. And fiery it is. At Fenway Park last Friday, hours before the Sox fell to the Texas Rangers, Ortiz sat down to a lunch of seafood paella, plantains, and other Dominican delicacies provided by his close friend Hector Pina, owner of the Roxbury restaurant Merengue. Pina describes his customers, including Ortiz, as hot sauce obsessives who will liberally douse most dishes on the menu. 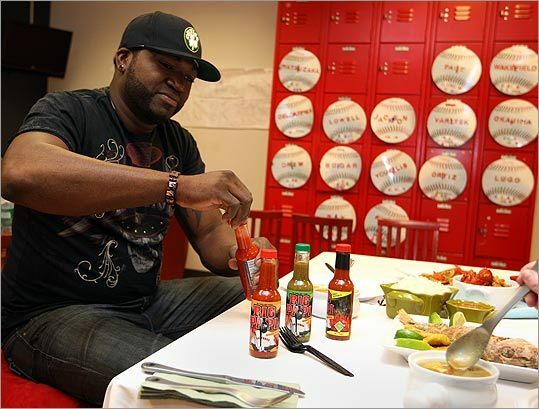 But when a bottle of Papi's own Grand Slam En Fuego - a brutal "xxxtra hot" mix of habanero, cayenne, chipotle, and garlic, with a picture of Papi wielding a smoking bat on its front - was proffered, even Ortiz himself didn't dare. The masochists are not his people. "I put hot sauce on pretty much everything," he says, aiming a bottle of his mild Original into a bowl of mondongo (beef tripe soup) before taking a spoonful. "But I like mild hot, not burning hot. Not crazy hot." His Monster Double - a medium-hot verde sauce with habanero, naga jolokia chili, and vinegar - is as daring as he'll go. "It's not about being a tough guy," he says. "I'm telling you right now, number four is pretty dang hot." He's referring to Grand Slam. "I do not think a human being should try something hotter than that." Ortiz worked with New York-based brand developers Off Beat LLC to create the line, and in the course of a year and a half, tasted multiple variations to determine the right blend of heat and spices. Original and Triple - dominated by slow-heating habanero peppers and quelled with vinegar - are ideal for flavoring fish, chicken, and meat post-grill, as well as, Ortiz points out, raw oysters. The jalapeno-based Double is well-suited for salsas and marinades. In all three, heat moves slowly through the mouth, from front to back, like tasters say it should. The Grand Slam might find greatest use as a party trick; it is not unlike a mouthful of razor blades. "I got burnt," says Ortiz, recalling a round of tastings in which he mistakenly heaped the scorcher into some of Pina's chicken soup. "I wasn't paying attention. When I sipped it, I saw flame coming out of my head." The line of sauces benefits the David Ortiz Children's Fund, which raises money for kids in need of medical care in New England and in Ortiz's native Dominican Republic. "The most important thing about the sauce is that we can raise money for my children's fund," says Ortiz. He adds that his teammates have tried the sauces, but his wife and children have not. "The kids don't really like to feel burning," he says, showing a look of concern for his visitor. "Hey, you need water or anything? Hector, give her a Gatorade." So yes, chiliheads, this sauce is hot. But tasty, and surprisingly nuanced, as well. Off Beat is marketing the product as a "lifestyle sauce," encouraging consumers to think beyond the condiment and use En Fuego in drinks, marinades, cold sauces, and during cooking. How about athletic enhancement? Studies have shown, after all, that the capsaicin found in many hot peppers can cause an endorphin rush similar to runners' high. "Oh, yeah?" says Papi. "Maybe I'll bring a bottle [to a game] and take a sip before I hit. See how that works." Big Papi En Fuego sauces are available at Stop & Shop stores ($4.99 a bottle) or go to bigpapienfuego.com ($7.95 a bottle, or $72 for a case of 12 if you're serious).